Let’s talk about a new leather tote bag! Okay, you’re about to leave the house to visit a friend. You need to bring a few things, but not enough to need your handbag. You want something casual and easy to take around for the day. Keep your new tote bag in close reach. It’s your ‘in case of anything’ bag. 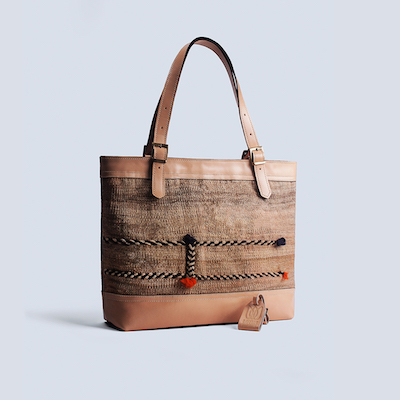 Our Lotus Handicraft totes are made from cotton and vintage Jajim or genuine leather and kilim. Strong and confident designs and craftsmanship, yet soft in colour and texture, you’ll love your new tote. It’s your café catch-up bag, your beach bag, your grocery shopping bag then take it all home before going out bag. You love to shop online, right? What girl doesn’t. You know the style you love: vintage and boho. And while the only thing you adore more than online shopping is perusing markets, it’s not always easy to find the time to do it. So, you start shopping, clicking the mouse and checking out websites, with the understanding that you’re probably not going to find something that’s unique. That’s not how tote bag online stores work. And, Lotus Handicrafts aren’t just any tote bag online chain website. We only make one version of each item, so if you’re wondering why the tote bags look so unique and like something you’d find in a vintage market, it’s because they are. You know those times when you need a bag, but you don’t want to carry your handbag. You just need a few things like your purse, keys, water bottle, oh… and those letters you need to post. If you try to hold them all, you’ll definitely lose them. Wouldn’t it be great to have something casual to take around for the day. Hello, tote bag: your ‘little trips’ bag. Finding your favourite tote bag online just got a whole lot easier. We don’t sell hundreds of products on our website. Rather, we source unique, Middle Eastern Kilim fabric from the markets and hand-make beautifully designed leather tote bags. Every piece has its own story to tell – crafted by the local village women who love to create these bags. Expect colourfully confident, perfectly patterned tote bags that you can wear across your shoulder – just get ready for all the compliments you’re about to get. Whether you’re taking your tote to your girlfriend’s house, the supermarket, the weekly gals café catch up or to the beach, it doesn’t matter. It just works. Although you’ll be wearing a leather tote bag that might fool your friends into thinking you just came back from a Middle Eastern adventure, you wouldn’t have left your lounge room. And being an Australian store (with ties to the Middle East), you know you’re supporting a local company (and those lovely village ladies who hand-make your bag). Just pick your favourite tote bag, enter your credit card details, and wait for your stunning new cultural accessory. Stimulate your senses and ‘travel’ every day, when you wear your Lotus tote bag. It’s our honour to bring unique art that’s made in the Middle East, to you. Australians love this bohemian style, but it’s not always easy to find good quality products, without spending thousands. We take the hassle out of sourcing premium tote bags, handbags, backpacks, and clutches. Come and meet the designer or pick your favourite Kilim bag online and we’ll send it to you, locally or worldwide. Why women are falling in love Lotus Handicraft tote bags? Fast delivery, no month-long waits. We send from Australia by Australian post. The Middle East. The home of authentic kilim. Not everyone is lucky enough to experience the culture of the Middle East, first-hand. But that doesn’t mean you can’t stimulate your senses in other ways. This is our desire with Lotus Handicraft – to bring unique art that’s made in the Middle East into the lives of Australians. We know women love artisan products, but they often come with a higher price tag. Not with us. We take the hassle out of sourcing premium tote bags, handbags, backpacks and clutches. Come and meet the designer or pick your favourite Leather tote bag online and we’ll send it to you, locally or worldwide. Find your unique Kilim creation.